Our next branding and social media workshop is just around the corner! Run by me and Katie King, our resident PR and Social Media guru, we’ll lead you through the world of branding for small businesses, and teach you how to use social media as a powerful platform for your business.The day will be hands-on and interactive (expect to be worked hard! ), but we can guarantee that you’ll walk away armed with tonnes of new knowledge to apply to your marketing. 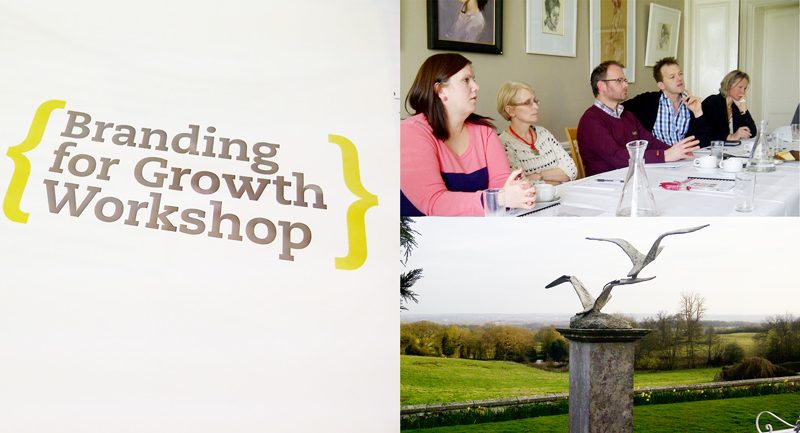 The vast majority of our guests score our workshops 10/10 for content, value and presentation. How will I benefit? For most businesses, competing in an ever-crowded marketplace is tough. We’ll help you pinpoint your niche in the market – that sweet spot which matters to your customers - and how to package that up into an engaging and compelling identity. This isn’t just about creating a pretty logo (although we’ll touch on the fundamentals of your visual identity too), it’s about understanding what you want to be known for, what your core values are and where you want your business to be in 5 years’ time – and being given the confidence to make your vision a reality. We’ll examine how you can gain equity in your brand and how to educate your clients thet you're worth paying for. Working through a hands-on workbook, you’ll be encouraged to think big about the future of your business, and put pen to paper by committing to the values you want to be known for. We’ll then move on to de-bunking the social media revolution, and give you the know-how you need to exploit social media to actually generate sales. We’ll discuss the importance of aligning social media with your wider marketing strategy, and explore the ways you can create compelling content to help you engage and interact with your target audiences. We’ll also equip you with the social media monitoring and listening tools that are available to measure the impact of your activity. You’ll leave with a clear understanding of how to exploit Twitter, LinkedIn, Facebook, YouTube and blogging for business, armed with plenty of advice on how to win fans and followers. Passionate about creating business-building brands, Hannah is absolutely dedicated to getting under the skin of her clients to understand what makes their businesses tick, transforming the vaguest of ideas into stunning brand identities which are tailored to the specific goals of each individual client. Aside from her popular blog, Hannah writes a monthly marketing column for local press, and is proud to have reached the finals in the 2011 West Kent Business Excellence Awards. Katie is a recognised expert in the PR and social media arena. With a career spanning 22 years, she's advised some of the world's leading brands. Katie was a director at leading tech agency, Text 100 Ltd, and co-founded her own PR agency in 2002. Katie is an enthusiastic and passionate trainer, and regularly speaks at regional events and seminars. She is also a trainer at The Social Media Academy, where she has trained journalists and other agencies as well as SMEs and corporates. Katie has a regular slot on BBC Radio Kent as their social media expert. I'm sold! How do I book? Held at the Royal Wells Hotel in Tunbridge Wells, the workshop costs £199 plus VAT to attend, including lunch, refreshments, your Branding for Growth workbook and all slides from the day, jam-packed with notes, reference points and tips. To make sure you get the very best from the workshop, we're keeping our courses limited to small groups – so they fill up fast! To reserve your place, please email studio@ditto.uk.com or call 01732 456944.